Eons ago, I remember seeing people link to Small Things jewelry around the web. After oohing and ahhing over the site, I eventually caved and ordered a ring (one of the bird designs with a blue background). I'm sure I wore it a few times, but then it got lost amongst the rest of my jewelry. A couple of months ago, I happened to find that ring again and after wearing it a couple of times (it matches one of the colors in my favorite dress almost exactly! ), I decided that I might need another one. So I went to the interwebs to see if she was still around, and of course she was! With even more designs! But I'm pretty partial to her "originals" line, and while I was browsing, I came across the art deco poppy design and I just couldn't NOT order it. I have a thing for poppies because they're the California state flower and I'm a native Californian. I can't help but like them. 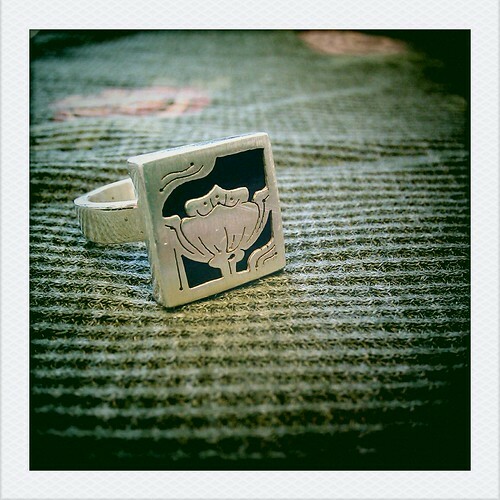 So I went with the poppy on a black background and ended up with the ring you see pictured above.